The municipality of Aguada is located just north of Rincon, and south of Aguadilla. There is strong evidence which indicates that Christopher Columbus' first landing in Puerto Rico (on November 19, 1493) occured at the shores of this municipality. His crew took on fresh water for their voyage back to Spain near the Guaniquilla coast at a place now named 'Los Pozos de Aguada' (The Wells of Aguada). The waters around this small town are excellent for both snorkeling and surfing. A popular surfing beach and excellent snorkeling area is 'Table Rock', located just north of town. Nice beachfront home on scenic beach in Aguada, Puerto Rico. Great balcony and deck for sitting and enjoying the views. This is a great watersports and fishing area. Great beach too! These two units (Vista Azul #1 & Vista Azul #2) are adjacent properties. Perfect for large groups that want to stay together. Sister property to Vista Azul #1. 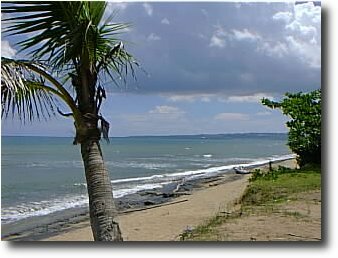 Nice beachfront home on scenic caribbean beach in Aguada Puerto Rico. Great balcony and deck for sitting and enjoying the views. Watch the whales in the Winter from the deck of this house in the caribbean. Great beach! A private and comfortable 3 bedroom vacation rental cottage between Rincón and Aguada. A large covered deck provides a spectacular view of the coast. Hammocks are provided with the rental for snoozing in the breeze. Barbeque pit, outside furniture also included. Hot water shower. Press here to view our Home Page or review other Properties.